It might seem a bit silly to dedicate a post to Foucault for the Theory & Religious Series here at the Bulletin blog. Foucault’s influence in many sectors of the liberal arts—including many of those I participate in and, I think it is fair to suggest, this blog—is immanent. Foucault has been, of course, roundly and rightly criticized from a number of different perspectives, including material studies, postcolonial theory, and so on. 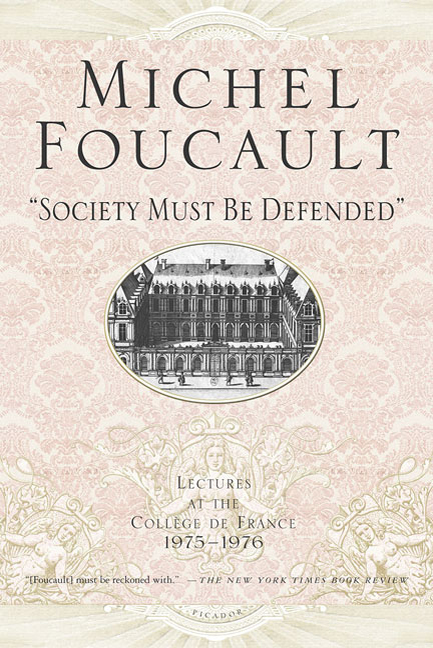 Many now approach Foucault through his critics or by simply using some of his elementary concepts such as discourse, genealogy, or relational power. In this brief post, despite a certain amount of redundancy and a number of Foucault’s interlocutors that I could also attend to, I want to explicitly point out some of the ways that Foucault has been generative for my scholarship in terms of thinking about history. Although I would suggest that there is plenty of room to critique the causal primacy Foucault gives to warfare, I find his account generative. History-making necessarily feeds into social struggles whether or not producers of historical accounts make this explicit. Foucault was not simply arguing, however, that a historical account will reflect the social position of its creator(s), but that the act of claiming a history of a people was an important historical development. Looking at aristocratic tactics against monarchical absolutism in Europe around the seventeenth century, Foucault argued that commonalities among a people (say, the idea of a Saxon people over against an inauthentic Norman monarchy) were constructed through historical accounts to produce a type of counterhistory, a genre bent to show how “kings wear masks, that power creates illusions” (72). This struggle was, for Foucault, a race struggle, and the resulting genre was distinct from and in contrast to the previous genre of history, which served to legitimate monarchical state rule. “Religion” is not a term used in these lectures to the extent that it would appear in later published works, but the questions Foucault brings up in regard to the instrumentality of history are easily applicable within religious studies, or at least those attracted to historicism. Who or what has history? Who is included in a history? What markers of commonality are embedded in a history? What types of divisions between peoples do our histories manufacture through presence and absence? Who is the assumed “we”? By what measure might we justify these inevitable divisions? These are fruitful questions to ask about the contexts that we study. But one of Foucault’s most significant contributions has been to prod scholars to objectify their own knowledge-production in light of these questions. The generative capacity of these types of questions—the questions of a self-reflexivity necessarily produced by Foucauldian histories of “history”—has lasted even as they have become well-worn scholarly tools. Jeffrey Wheatley is a graduate student at Northwestern University. His research explores formations of religious contestation, racialization, the state, and capitalism with a focus on nineteenth-century North America. Of late he has been researching the epistemologies at work in missions to Native Americans, representations of Catholic exceptionalism in the American West, and Gilded Age corporate religious sensibilities. He is on Twitter @wheatleyjt. This entry was posted in Religion and Society, Religion and Theory, Theory & Religion Series, Theory and Method and tagged Achille Mbembe, Jeffrey Wheatley, Michel Foucault, Society Must Be Defended. Bookmark the permalink.